Swans – led by Emma-Jane Maguire. “Good recovery” said someone, as we were leaving the Royal Opera House last night; and assuming he was talking about the performance of Swan Lake we’d just seen, I’d entirely agree: the Royal Ballet, on the opening night of their new season, had redeemed a disappointingly flat first half with a cracking Act 3 and and an emotional finale. The company’s current production, by Anthony Dowell, has just passed its silver jubilee and its over-decorated fussiness and misguided outbreaks of inane by-play have become no easier to tolerate over the years. But as every one of the 20 shows in this run has completely sold out, I don’t imagine that replacing it – a hugely expensive undertaking – is high on the new director’s to-do list; ballet-goers who don’t find it to their taste must either stay away or focus their attention entirely on the choreography and the dancing. Marianela Nuñez & Thiago Soares in Swan Lake. So casting is crucial, and I’ve been looking forward to discovering how Kevin O’Hare’s choices will differ from Monica Mason’s. For his first night he played very safe, giving the leading roles to a well-established and popular couple and putting his entire team of 11 senior soloists onstage in support of them – something I don’t remember ever happening before. I like that as an opening gambit but also look forward to seeing how he will use the talent further down the company – 20 shows should allow plenty of opportunities. Boris Gruzin, the evening’s conductor, seems to favour slow tempi and the first bars of the overture – one of the most beautiful passages in the whole score – were excessively drawn out, putting a bit of a damper on the performance of the piece even before the curtain went up. Act 1 is too busy, and over produced, though there and throughout I liked Thiago Soares‘s sincerity and manner as Siegfried; Act 2 is the heart of the piece and brings us our first sight of the ballerina – Marianela Nunez tonight. I’ve seen her as Odette since her earliest outings in the role and have been entranced, first by the simplicity of her dancing and later by her emotional engagement in her story, so I was really taken aback to find that she seemed, temporarily I’m sure, to have lost both of those characteristics. I’ve noticed something similar in other roles recently – in the pas de deux in Ashton’s Birthday Offering for instance – and I wonder if she feels that the way to move up to the next stage in her artistic development is by doing more and more with the steps, pushing the choreography to, and possibly beyond, its expressive limit – trying too hard, in other words. I wished she’d pull back a little and let her acting carry some of the load. And in the next act she did just that, giving us one of the best Odiles I remember seeing. She looked as if bamboozling innocently trusting princes was her favourite thing in the world, the most fun she’d ever had, and it was no wonder Siegfried found her irresistible – who wouldn’t? The evening took a sudden turn for the better; everywhere I looked there were strong, lively soloists who understood how to make their effects: Ricardo Cervera in the Neapolitan Dance (with Laura Morera, no less), Bennet Gartside leading the Czardas, Thomas Whitehead in the Mazurka; and the big pas de deux went like a dream. The momentum carried on through Act 4 and it was only in the closing seconds that this theatre’s continuing inability to to move a boat from one side of the stage to the other without stops and starts and lurches brought us back to earth. A good recovery indeed but next time let’s hope that won’t be needed. Tara-Brigitte Bhavnani & Thomas Whitehead in Swan Lake Mazurka. 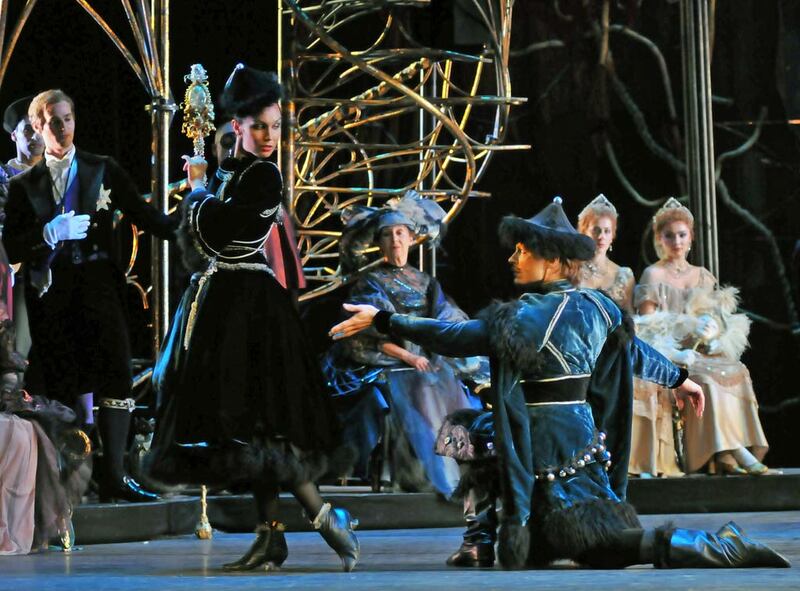 Please let Kevin O’Hare have the vision – and budget – for a new Swan Lake. Longevity is no guarantee of worth – we have had 3.5 new Sleeping Beauties during the 25 years this unimaginative and fussy Swan Lake has been around!